This cake was a self-portrait of me (the blonde) and some of my chef friends just having fun decorating cupcakes. Our bodies are also cupcakes (turned upside down). The "french" chefs are modeled from fondant and modeling chocolate and the cakes are french vanilla with basil vanilla filling with and a single hazelnut in the center to depict our nutty personality. Wow Amazing Cake Ann! Thank you so much for entering it at Wedding Cakes For You This competition just keeps getting more challenging. The flavors are intriguing as well. Please ask your friends and family to comment and rate. The more the better for the final voting. 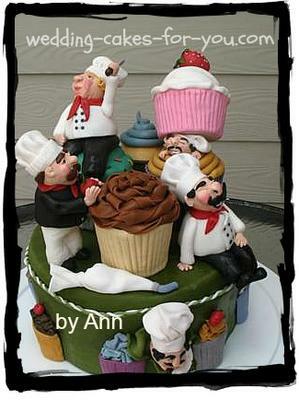 Spread the good word about your chubby chefs cake! I Just love this cake...it's just plain ol' fashioned "fun" looking!! Your characters on it are incredible...I hope to be this good one day! Very creative! Not crazy about the color of the base--other than that adorable!